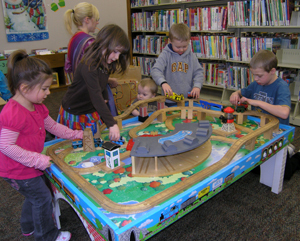 Tax dollars alone cannot adequately fund the services and resources of the Oshkosh Public Library. Our pledge to provide access to information, knowledge, culture, community history and technology can only be fulfilled with the help of generous donors who value our work in the Oshkosh community. Donations would fund the purchase of book sets, developmental toys and related incentives for participants in the High Hopes program, which shows parents how to teach the early literacy skills that will help their children to become successful readers. The library continues to build its collection of eBooks and digital audio books to meet the growing demand for readers of all ages. Donations would fund projects that create digital copies of local history books, photographs, and community information to preserve the history of the Oshkosh area. Please contact Library Director Jeff Gilderson-Duwe at 236-5210 to discuss ways that your donation can help to fund these or other library projects.